above the arctic circle to explore, sail, fish & chase some spring slush. As much as James Bond is defined by his outlandish gadgets, one of the most important tools for real-life spies is actually much less flashy: maps. Whether used to gather information or plan an attack, good maps are an integral part of the tradecraft of espionage. 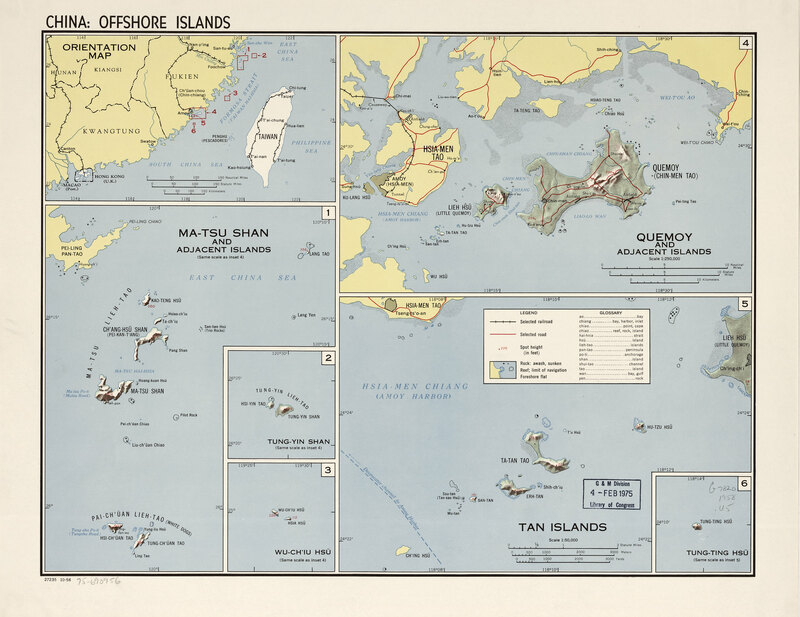 Now, to celebrate 75 years of serious cartography, the Central Intelligence Agency has declassified and put decades of once-secret maps online. These days, the C.I.A. and other intelligence agencies rely more on digital mapping technologies and satellite images to make its maps, but for decades it relied on geographers and cartographers for planning and executing operations around the world. Because these maps could literally mean the difference between life and death for spies and soldiers alike, making them as accurate as possible was paramount, Greg Miller reports for National Geographic. “During [the 1940s], in support of the military’s efforts in World War II...cartographers pioneered many map production and thematic design techniques, including the construction of 3D map models,” the C.I.A. writes in a statement. At the time, cartographers and mapmakers had to rely on existing maps, carefully replicating information about enemy terrain in pen on large translucent sheets of acetate. The final maps were made by stacking these sheets on top of one another according to what information was needed, then photographed and reproduced at a smaller size, Miller reports. 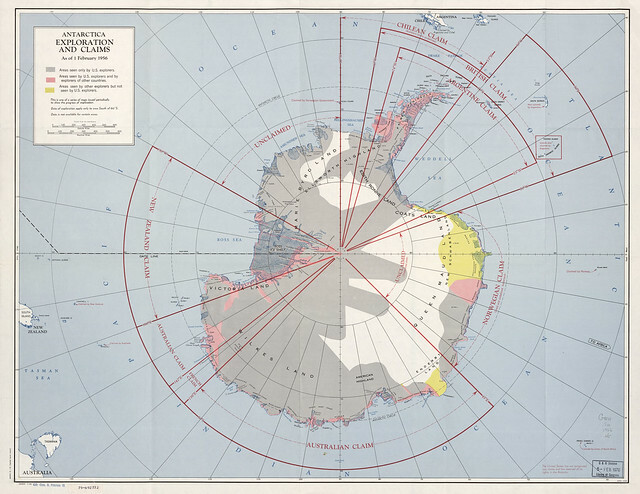 All of this was done under the watchful eye of the then-26-year-old Arthur H. Robinson, the Cartography Center’s founder. Though World War II-era intelligence services like the Office of the Coordinator of Information and the Office of Strategic Services eventually morphed into the C.I.A. 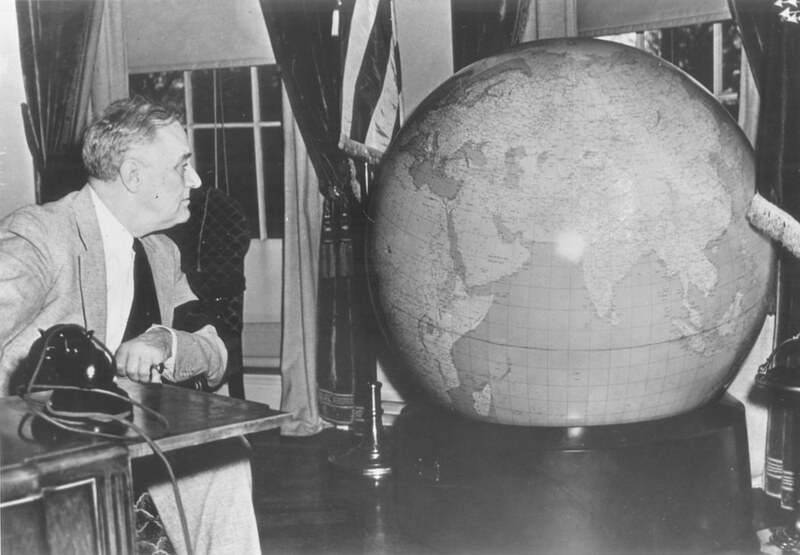 as we know it today, the Cartography Center was a constant element of the United States’ influence abroad. Looking through the collection of declassified maps is like looking into a series of windows through which government officials and intelligence agents viewed the world for decades, Allison Meier reports for Hyperallergic. 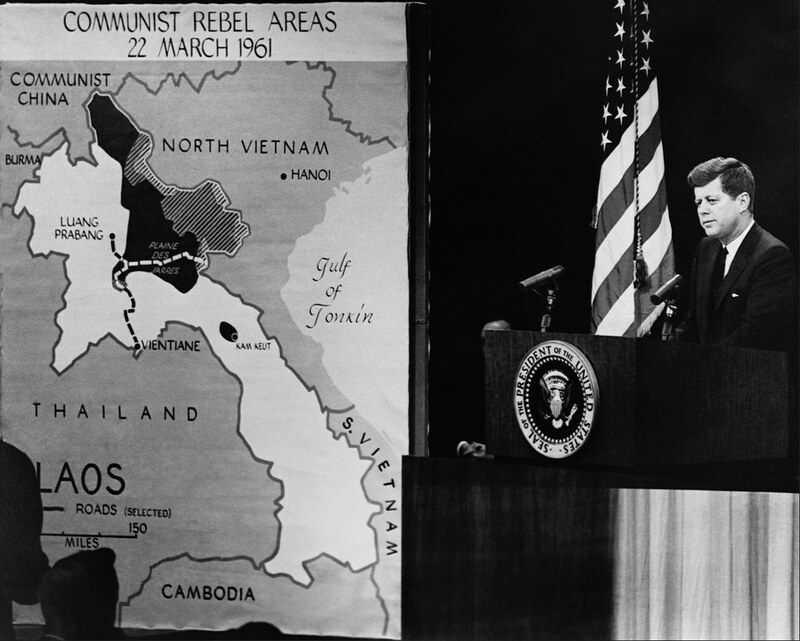 From the early focus on Nazi Germany and the Japanese Empire, the maps show shifting attention towards the Soviet Union, Vietnam and the Middle East, to name just a few examples. As interesting as these maps are to look at, it’s sobering to remember that they played a major role in shaping global politics of the 20th century. 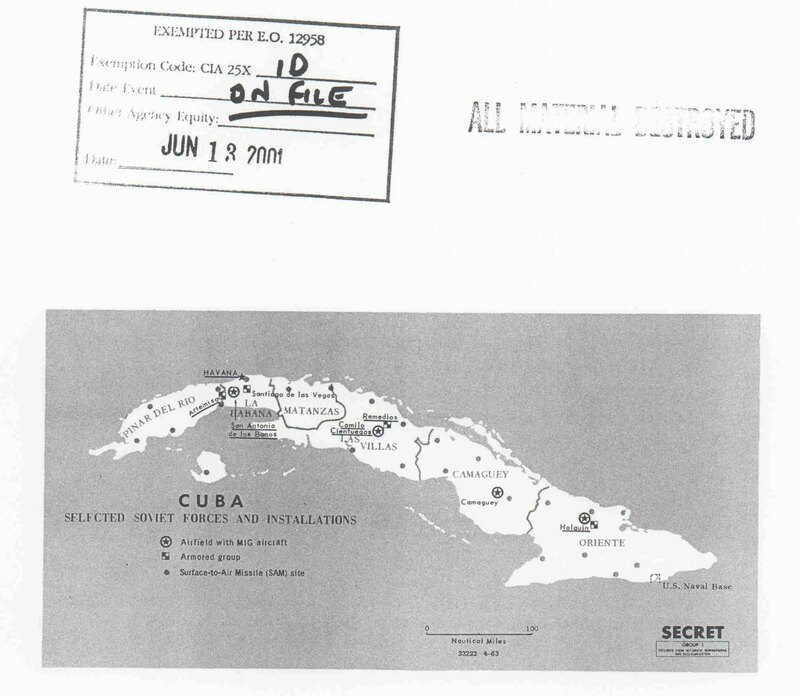 These were the documents that U.S. government officials relied on for decades, whether it was predicting global trade in the 1950s or preparing for the Invasion of the Bay of Pigs in Cuba in the 1960s. Intelligence briefings may more often be done digitally these days, but whatever medium a map is made in, knowing where you are going remains critical to understanding—and influencing—world affairs. In 2015, a weak monsoon season left parts of India with 40 per cent below average rainfall, its farmlands littered with withered crops. To prepare farmers against future unpredictability, experts are now turning to a team of robots, adrift in the sea. Researchers from the University of East Anglia and the Indian Institute of Science have joined up to deploy seven robots, called gliders, along India's coastline, for the £8 million Bay of Bengal Boundary Layer Experiment (BoBBLE). Every three hours these winged machines autonomously sink to 1,000 metres and rise again, using sensors to detect mixing between currents in the ocean that bring heat to the surface and drive monsoons. "They generate forward movement using their wings; they can direct their path to wherever you tell them to," says Ben Webber, a University of East Anglia oceanographer working on BoBBLE, and piloting the gliders from the UK. In 2017, BoBBLE researchers will begin analysing the results: combined with atmospheric data, the robots' readings will provide closer predictions on the extent of monsoon rainfall and when it will hit land. Fed back to farmers via weather stations and phone alerts, it could suggest best times for planting crops. The BoBBLE gliders aren't alone: they join a 400-strong army of bots in the sea that are gathering varied data from around the world. "The range of autonomous platforms that are becoming available is seen as the future of oceanography," Webber says. Where we used to rely on costly ship missions to gather data from the ocean, we're turning to gliders, autonomous underwater vehicles and sensors - embedded on the sea floor, sunk into the water column or set adrift on the waves - to feed information back to us. By exploiting the ocean as a vast information source, these instruments are providing unprecedented detail on everything from climate change to underwater volcanism and fisheries. In 2017, as the technology makes its mark on the waves, we can expect to see an uptick in the data, bringing us new depths of understanding about the planet. Operations engineer Chris Wahl deploys MBARI’s Wave Glider, Tiny from the R/V Paragon for another mission. Tiny is an autonomous surface vehicle (ASV) that has a surfboard-like float with a tethered glider below, equipped with spring-loaded paddles that use wave energy for motion. Solar panels on its surface power the scientific instruments and satellite communications as it travels. We are beginning to use ASVs instead of ships for certain well-defined, repetitive oceanographic tasks. We are also developing ways to use them as communication gateways and navigation aids for autonomous underwater vehicles (AUVs). Gliders have been deployed everywhere: from the Arctic (to measure the pace of melting ice) to the US East Coast (to watch for incoming hurricanes). Elsewhere, other instruments are measuring short-term changes - such as sudden blooms of toxic algae that threaten human and ecological health. Off the coast of Washington State, pods called Environmental Sample Processors, developed by California's Monterey Bay Aquarium Research Institute, are sensing toxic blooms produced by Pseudo-nitzschia algae that threaten to infest edible shellfish onshore. " [The Research Institute] had the vision of miniaturising a lab and leaving it out in the ocean," says Stephanie Moore, a scientist with the US National Oceanographic and Atmospheric Administration's Northwest Fisheries Science Center, who's working with University of Washington researchers to carry out the project. Using a robotic arm, the pod takes a water sample, then withdraws it into the main body where it's screened for algal toxins using filters and reagents. Within four hours, the pod's results can be transmitted via satellite as a warning if there's a threat. With the incidence of harmful algal blooms rising globally - marked by coastal closures and mass strandings of animals that succumb to its toxins - the relevance of these algae-detecting units will grow. In terms of scale, the most impressive data gathering is coming out of the Ocean Observatories Initiative (OOI), a huge venture launched in 2016 after ten years of construction on the sea floor. It's made up of seven data-transmitting arrays that flank North and South America. Each is surrounded by moorings that act as centre-points for over 830 instruments situated throughout the water column and on the sea floor. These instruments - gliders, autonomous vehicles, cameras and seismic sensors - will feed a stream of information back to the arrays. "To have it in one cohesive package with such a geographic range is absolutely unprecedented," says Richard Murray, director for the Division of Ocean Science at the US National Science Foundation, the organisation funding the $386 million (£293m) venture. OOI's research remit is broad. Its instruments will track changes in sea-floor geology that could trigger earthquakes; detect minute shifts in temperature, salinity and ocean mixing to map long-term climate-change trends; and identify nutrient flows to pinpoint productive fisheries. Already, it's having real-world impacts. OOI's autonomous underwater vehicles are sensing nutrient upwellings along the eastern US coastline, and predicting how they'll drive fisheries, says Glen Gawarkiewicz, an oceanographer at the Woods Hole Oceanographic Institute, Massachusetts. "I have been using some of the data to communicate with commercial fishermen about recent changes in the region," he says. The platform isn't just for researchers, however. Throughout their existence the arrays will be streaming data via cable and satellite in near-real-time to whoever wants to tune in. "Anybody can use it, any state, any country, anybody, anywhere," Murray says. "That's the way science should be." He sees OOI's potential as an undersea laboratory where future technologies may be tested, furthering innovation. "The. science will enable people to answer questions we haven't even asked yet," he says. With the spread of seafaring instruments in 2017 and beyond, our ocean-based intelligence is projected to rise. 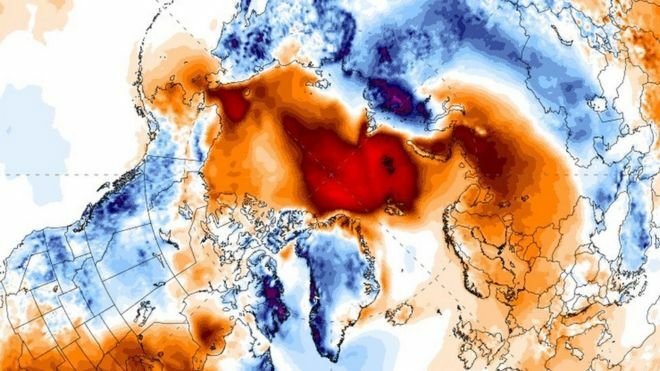 Temperatures at the North Pole could be up to 20 degrees higher than average this Christmas Eve, in what scientists say is a record-breaking heatwave. Climate scientists say these unseasonably warm weather patterns in the Arctic region are directly linked to man-made climate change. Temperatures throughout November and December were 5C higher than average. It follows a summer during which Arctic sea ice reached the second-lowest extent ever recorded by satellites. Dr Friederike Otto, a senior researcher at Oxford's Environmental Change Institute told BBC News that in pre-industrial times "a heatwave like this would have been extremely rare - we would expect it to occur about every 1,000 years". Dr Otto added that scientists are "very confident" that the weather patterns were linked to anthropogenic climate change. "We have used several different climate modelling approaches and observations," she told BBC News. "And in all our methods, we find the same thing; we cannot model a heatwave like this without the anthropogenic signal." Temperatures are forecast to peak on Christmas Eve around the North Pole - at near-freezing. The warm air from the North Atlantic is forecast to flow all the way to the North Pole via Spitsbergen, giving rise to clouds that prevent heat from escaping. 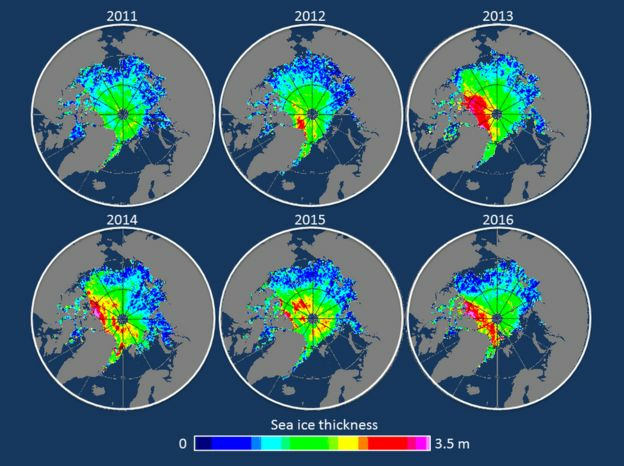 And, as Dr Otto explained to BBC News, the reduction in sea ice is contributing to this "feedback loop". "If the globe is warming, then the sea ice and ice on land [shrinks] then the darker water and land is exposed," she said. "Then the sunlight is absorbed rather than reflected as it would be by the ice." Forecasting models show that there is about a 2% chance of a heatwave event occurring every year. "But if temperatures continue to increase further as they are now," said Dr Otto, "we would expect a heatwave like this to occur every other year and that will be a huge stress on the ecosystem." Dr Thorsten Markus, chief of NASA's Cryospheric Sciences Laboratory, said the heatwave was "very, very unusual". "The eerie thing is that we saw something quite similar (temperatures at the North Pole of about 0C in December) almost exactly a year ago," he told BBC News. The freeze and thaw conditions are already making it difficult for reindeer to find food - as the moss they feed on is covered by hard ice, rather than soft, penetrable snow. Asked if the conditions on Christmas Eve were likely to affect Santa's all-important journey, Dr Markus said he was confident that his sled would cope with the conditions. He added: "Santa is most likely overdressed though. Maybe in the future we'll see him in a light jacket or plastic mac." Wooden Ships explores European maritime activity and observations from 1750 to 1850. The data consists of logbook entries written by the captain of each ship. The location of each ship is spatially aggregated in hexagonal bins. Filter the map by country or time to better understand varying shipping patterns by colonial powers. Hover over the ships or hexbins to view summary weather statistics. Click a hexbin to view handwritten log entries about weather observations as well as candid events at sea from the captains! Select ships with particular weather or climatic features, such as temperature recordings or encounters with sea ice. Check out wind speed patterns across the Atlantic. Users can also examine wind patterns, weather reports, and notes from the captains’ logs. This application will enhance your understanding of the geography and environmental history of maritime trade! Data sources: Climatological Database for the World's Oceans 1750-1850 for digitized shipping logs, Natural Earth for line work, and The Noun Project for icons. Cartographers/developers/designers/shipping enthusiasts: Scott Farley, Starr Moss, and Meghan Kelly. Morgan Herlocker has also used the Climatological Database for the World's Oceans to create an interactive map of international ship traffic between 1750 and 1850. These historical ship logbooks contain a wealth of data both about the routes taken by ships and the weather conditions encountered by the ships during their voyages. Morgan took the location data from these 100 years of ship logs and plotted them on a Mapbox map. One thing that clearly emerges from mapping all this data is the routes of the major shipping lanes from 1750-1850.
in less of 50 days, arriving on Xmas day. When Francis Joyon took nearly two weeks off the solo RTW record in 2008, we figured it would be a long, long time before anyone became king of that particularly mountain. Today, a new king will be crowned in what should go down as the most impressive feat of the year. Beating solo world record by more than 8 days isn’t just smashing it - its epic! 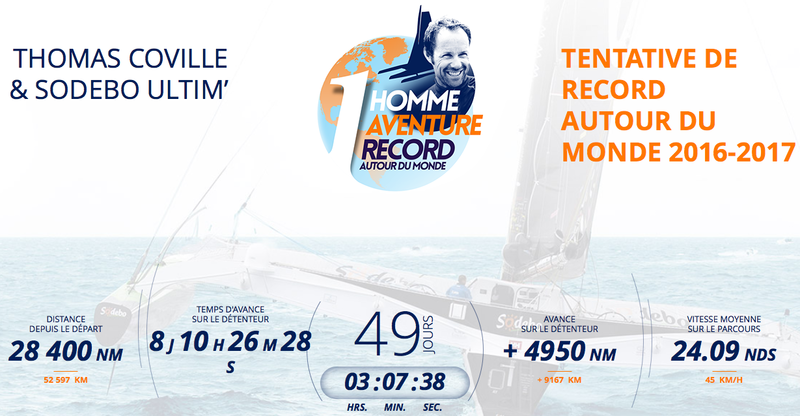 Thomas Coville is set to take more than a week off of Joyon’s still incredible mark when he arrives in Brest in a couple of hours, achieving a time that would beat even the crewed records until just a few years ago. It’s interesting to note that fewer people have sailed around the world alone, nonstop in a trimaran than have walked on the moon – just Ellen Macarthur, Francis Joyon, and Coville, and each of them now have owned that all-important trophy. Coville, along with his sponsor – convenience-store-sandwich-maker Sodebo – deserve massive accolades, and not just for the second-most important ocean sailing record in the world: Their perseverence and tenacity has been nothing short of incredible! This is Thomas’ 6th attempt at the same record, and to come back and do it again after just the sheer heartbreak of missing it by just hours in 2014 – that’s the stuff of legends. If you want to understand what it means to the French to have such ownership of the most important records in the sport, watch this video of a French naval pilot talking to Thomas a couple of hours ago. With barely two weeks remaining before 'The Big Turn Right' on Boxing Day, a number of the grand prix performers – including Black Jack, CQS, Wild Oats XI and Ichi Ban - were to be seen offshore in training and work-up mode today, enjoying perfect sailing conditions. The Bow Caddy team sent their aerial camera out to capture the last yacht to return through the Heads as she headed into the harbour in the late afternoon sun. CNN : Sydney-Hobart 2016: Race record set to topple?